JD 8120 MFWD, JD 6190R MFWD, JD 7130 MFWD, JD 7430 Premium MFWD, JD 9560 STS, (8) Long all steel -box barns, Granville green leaf & dry leaf systems, Powell 2-row harvester, JD 6100 & 6000 hi=cycles. Friday sale!! Directions: Being on I-95, take Exit 119, (Hwy. 42), turn west, travel 7.5 miles, left on Zelma Rd., travel 1 mile, sale on left. Being in Kenly, take Hwy. 222 west for 3 miles, turn right on Beulatown , travel 1 mile, left on Zelma Rd., travel ½ mile, sale on right. Watch for auction signs. John Deere 8120 MFWD, SN-PO15721, powered by208 hp, 6-cyl. diesel, power shift transmission, differential lock, 1000 pto, (4) sets remote hydraulic outlets, 420/90R30 front tires, 480/80R46 dual rear tires, 3084 hrs., power beyond remotes, rear wheel weights. John Deere 6190R MFWD, SN-RE6190RVCA00542, powered by 190 hp 6-cyl. diesel, power quad plus transmission, left hand shuttle, differential lock, 540 & 1000 pto, (4) sets remote hydraulic outlets, 16.9R34 front tires, 480/80R50 rear tires, 1760 hrs., right hand door cab. John Deere 7130 Premium MFWD, SN-RW7130H014060, powered by 121 hp 6-cyl. diesel, power quad transmission, left hand shuttle, differential lock, 540 & 1000 pto, (3) sets remote hydraulic outlets, 14.9R30 front tires, 420/80R46 rear tires, 3330 hrs., right hand door. John Deere 7430 Premium MFWD, SN-H007746, powered by 166 hp 6-cyl. diesel, power quad transmission, left hand shuttle, differential lock, 540 & 1000 pto, (4) sets remote hydraulic outlets, 14.9R30 front tires, 420/80R46 rear tires, 2901 hrs. John Deere 7730 MFWD SN-A02455, powered by 190 hp 6-cyl. diesel, power quad plus transmission, left hand shuttle, differential lock, 540 & 1000 pto, (3) set remote hydraulic outlets, 420/85R34 front tires, 480/80R50 rear tires, green star ready, 2660 hrs. John Deere 9560 STS combine, 4-wheel drive, 1387 separator hrs., 2192 engine hrs., 18.4R38 duals, SN-5715489. John Deere 693 6-row corn head, 30” poly snouts, SN-X675451. John Deere 625F hydra flex grain head, full finger auger, SN=F715782. Toyota 42-6F6U25 LP gas tow motor, 5000# capacity, 12,743 hrs., SN-63878. (seems to operate ok on dirt path). ’90 IH 4900, 6-cyl., 5-speed w/2-speed, air brakes, west coast mirrors, 22.5 tires, w/Quality 16’ twin cylinder dump w/4’ grain sides, 236 wheel base. ’83 IH S, 6-cyl. gas, 5-speed w/2-speed, west coast mirrors, 10:00-20 Spokes front & rear, 16’ body w4’ grain sides, 188” wheel base. ’83 Chevrolet 60, 8-cyl. gas, 4-sped w/2-speed, west coast mirrors, 8:25-20 Budds front & rear, Quality 16’ twin cylinder dump. ‘70’s GMC 6500, 8-cyl. gas, 5-speed, west coast mirrors, 9:00-20 Spokes front & rear, Quality 16’ twin cylinder dump. ’98 Chevrolet 1500m 4×4, V8 gas, automatic, 16” tires, gooseneck ball, 250K miles. ’95 Chevrolet 1500 extended cab, 4×4, V8 gas, automatic, 16” tires, gooseneck ball, 201K miles. (2) ’94 Chevrolet 1500 extended cab, 4×4, 8-cyl. gas, automatic, 16” tires, (1) 180K miles, (1)266K miles. (2) ’97 Chevrolet Suburban, 4×4, 8-cyl. gas, automatic, 16” tires, (1) 262K miles (1) 243K miles. 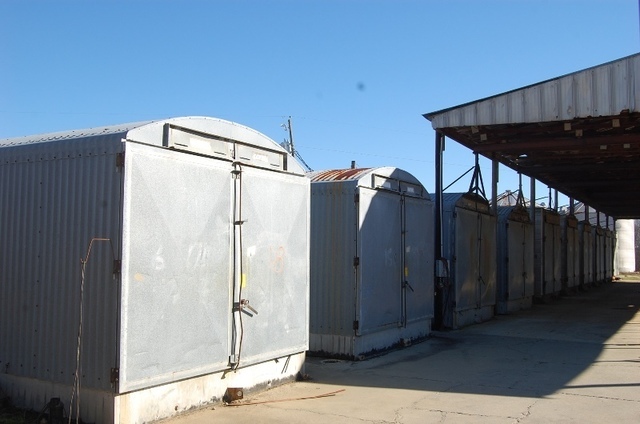 BULK BARNS, TOBACCO & IRRIGATION EQUIPMENT. (4) Long all steel 8-box barns, Long heat exchange. (12) Long (blue trim) 8-box barns, Long heat exchange. Note: All barns are 1 ph. Granville 60” x 21’ pit conveyor. Granville tumbler w/in feed incline conveyor, 24” x 16”. 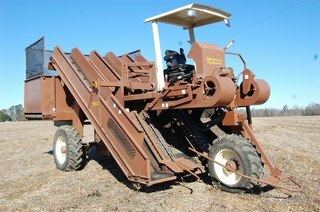 Granville baler w/36’x27’ incline conveyor w/scales & power pac. Hydraulic box lay down w/38’ box rail. Granville precision box load w/electric power pac. (3) Granville 32’ gooseneck tobacco trailers., hydraulic driven, 15” tires. Granville 2-row stripper w/live bottom dump box, 4-cyl. Deutz diesel, 699 hrs. Granville live bottom box, 3-pt. Mercer 20’ x 8’ hydraulic box, used to fill boxes, 2-compartment. Taylor 2-row harvester, JD 4-cyl. diesel, w/Sheppard dump box, w/defoliating heads, SN-9503. Powell 6342, 2-row harvester w/dump box, JD 4-cyl. diesel, defoliating heads, SN-63430. 9’ x 16’ plant rack, 3-tier, mouths on flatbed. 6’x 12’ plant trailer, single axle, 14”tires, steer pin hitch. (8) Dayton 2-ton chain hoist w/dolly & rail, for Long boxes. Long rail extension‑ – several. Checchi & Magli 4-row carousel setter w/tray racks, 3-pt. 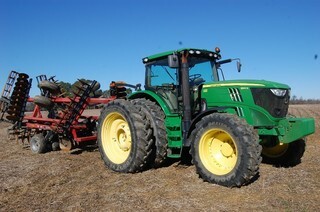 John Deere 630, 21’, 58-blde hydraulic fold disc, 9” spacing front & rear, tandem wheels, trailer-type. Case IH 340, 22.5’, 60-blade hydraulic fold disc, hydraulic lever remlnger rolling basket, 9,” spacing front & rear, tandem wheels, trail-type. KMC 4-row rolling cultivator w/First Products fertilizer, 3-pt. Long 20’ hydraulic fold field cultivator, double rolling baskets, 3-pt. Unverferth Perfecta II 13’ field cultivator, 3-pt. WilRich 2500, 20’ field cultivator, hydraulic fold, pull type. ?John Deere? 13-shank chisel plow, 2-bar, 28” clearance. Blanton 8-shank chisel plow, 28” clearance. KMC 8-row ripper bedder, hydraulic fold, floating parallel linkage, adjustable gauge wheels, hydraulic row markers, set on 46”. KMC 4-row bedder w/dirt door,3-pt., used for re-ridging. DMI 2500, 9-shank ripper, set on 20”, 3-pt. John Deere 9-shank V ripper, 3-pt. John Deere 6-bottom semi-mount plow. KMC 6-row strip till w/JD 1700 vacuum planer w/MaxEmerge Plus row units, hydraulic fold row markers, KMC lift assist wheels, set on 30”. John Deere 6100 hi-cycle, 4-cyl. diesel, cab, 320 gal. tank, topper remotes, set up to spray 8-row tobacco, JD rate control, 2387 hrs., SN-X000146. John Deere 6000 hi-cycle, 4-cyl. diesel, cab, 320 gal. tank, standard transmission, set up to spray 8-rows tobacco, 9755miles, SN-X011249. John Blue 200 gal. nitrogen rig, 8-shank, ground driven pump, hydraulic fold, 3-pt. Sheppard 200 gal. front mount tank. 300 gal. front mount tank, last on 7430. (2) 200 gal. front mount tanks, last on 7130 & 7430. (2) 1000 gal. nurse tanks on skids. Reed 5000 bu. grain bin w/aeration fan, 6” unloading auger. (2) Bins w/8’ doors cut in the side to drive forklift in, used as storage. Neco electric/ grain seed cleaner. John Deere HX10 rotary cutter, 540 pto, 3-pt. Hardee SH-360-60 ditch bank cutter, hydraulic slide, 540 pto. John Deere 14’ rotary cutter, 3-pt. Hardee LR40160 long arm hydraulic cutter, 540 pto. Land Pride 55 hydraulic blade, 10’, 3-pt. John Deere V ripper frame. Offset ditcher, hydraulic driven, 3-pt. Winpower 80KW pto generator, 540 pto, mounted on single axle tailor. 39’ long, 30’ wide,12’ tall in center metal style shelter. 23’ long, 30’ wide, metal style shelter. 58’ long, 18’ wide metal style shelter. These shelters are made from sq. tubing & are covering dry leaf system & green leaf system. 8’ x 18’ all steel flatbed trailer, 14.5 tires, pin hitch. (2) Approx. 6000 gal. fuel tanks w/electric pump (1) gas, (1) diesel. 100 gal. fuel tankon single axle carrier, battery operated pump,2” ball hitch. John Deere front suitcase weights. (4) ICE steam jenny for parts – motors are good. 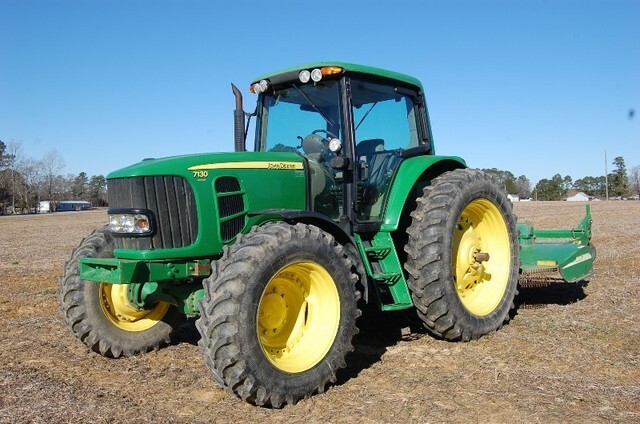 Lease Tractor – sells subject to Lease. John Deere 6150 MFWD, 6-cyl. diesel, power quad w/left hand shuttle, differential lock, 540 & 1000 shift-on-the-go pto, (3) sets remote hydraulic outlets, 380/85R30 front tires, 420/80R46 rear tires, 870 hrs. – 2 yrs. remaining @ 300 hrs. / year or but the entire outfit & own it all. Auctioneer’s Note: This is a complete dispersal of a father-son retirement & health situation. For more info call Bobby 252-205-6111 or 919-284-4231 or Brent 252-205-6115 cell or 919-284-4610 home. John Deere 7810 MFWD, cab, 42”duals, 16.9R28 front tires, 10,522 hrs., engine rebuilt by JD spring 2018. (2) John Deere 4230, quad range, 4-post canopy, (2) sets remote hydraulics, 10-00- 16 front tires, 18.4-38 rear tires. (2) John Deere 4430, 4-post canopy, dual remote hydraulic outlets, standard transmission, 10:00-16 front tires, 18.4-38 rear tires. 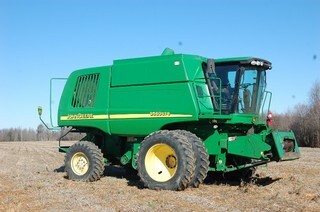 John Deere 4440, quad range, 4-post canopy, (2) sets dual remote hydraulics, 10:00-16 front tires, 18.4-38 rear tires. Holmes 600 wrecker body mounted on ’77 IH 4370. Agri-Craft Agr 911730-0 stainless steel spreader, dual spinner, 16.15L tires. Sheppard 4-row lay by rig mounts on JD hi-cycle. Sheppard 200 gal. 4-row nitrogen rig w/John Blue ground driven pump, 3-pt. Hardee 7’ rotary cutter, 540 pto, 3-pt. (2) Single axle semi-dollies, set up to pull w/farm tractor. (2) Bulk barn moving dollies, 2 & 3-axle. (2) Clean out buckets, 68 & 85”, made out of loader buckets. 16’ live bottom trailer, runs off tractor remotes, last used to haul weeds out of field. EZ Trail 510 grain cart, 1000 pto, w/roll over tarp.